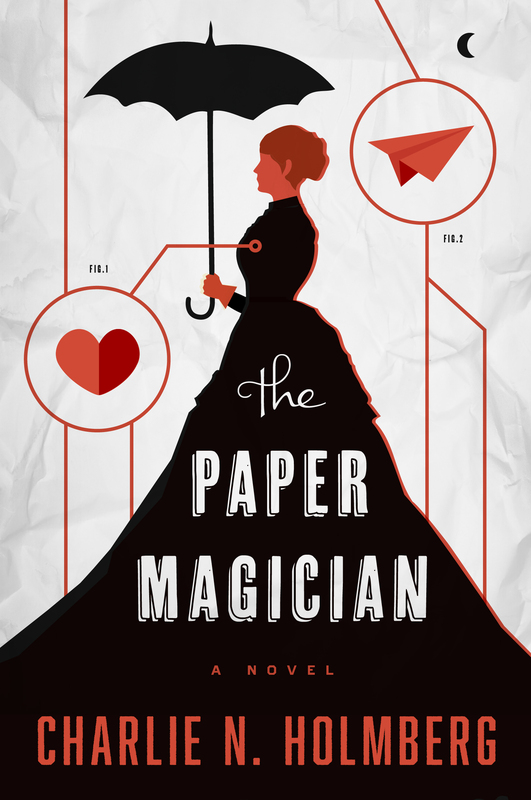 The Paper Magician and the Woman Who Invented Her. I am so thrilled to host Charlie N Holmberg here as my guest today. In her debut novel, The Paper Magician, she has created a world and a story which is fantastic in the true sense of the word. And it’s terrific too. I enjoyed this book and can’t wait to read more from Charlie. Smart, fresh, sweet, and full of heart, I highly recommend it. Here to explain her world better than I could is Charlie herself. My debut novel, The Paper Magician, takes place in an alternative 1902 London, England. I say alternative because magic has tweaked it. In the world of The Paper Magician, people have learned how to cast spells through manmade materials: glass, paper, rubber, metal alloys, plastic, even fire and flesh. So, though it’s 1902, plastic is in wide use. Advancements in metal and rubber have made automobiles fairly common. Electricity is still somewhat new, but is often replaced with bulbs consisting of enchanted glass and flame. Funny thing is, The Paper Magician wasn’t actually written to be in our world at all. The first couple drafts of the book take place in Perget City, which is the capital city of Amaranda: a country modeled after early twentieth-century England. I usually write other-world fiction. One of its perks is that I can more or less invent whatever I need for my story to work. I want a boat scene? Bam, the city now has a river. My protagonist needs someplace to hide? I wave my magic mouse and there’s now a mountain range riddled with caves. So long as I stay consistent, I can make the world whatever I want. But it was a lot like England. Enough so that my editor caught on and strongly suggested I change the setting to England, which ultimately worked well with the story and gave it a historical flare. Perget City became London, Amaranda turned into England. The continent of Manomas shifted in Europe, and all was hunky dory. Well, not quite. There were tricky revisions to make. In the end, I feel the setting of the book makes the story much more relatable, and it let me wonder, What would this real place be like with the advancements of magic? It’s also inspired me to try my hand at a true historical in the future . . . we shall see! I hope you enjoyed hearing about this wonderful tale and author. And if you need a good read, you know what to do. In which I tell you what literature means; okay, not all of literature, but definitely a part of it. From an author’s perspective and a teacher’s perspective. No, really. This is a meme I’ve seen circulating lately. 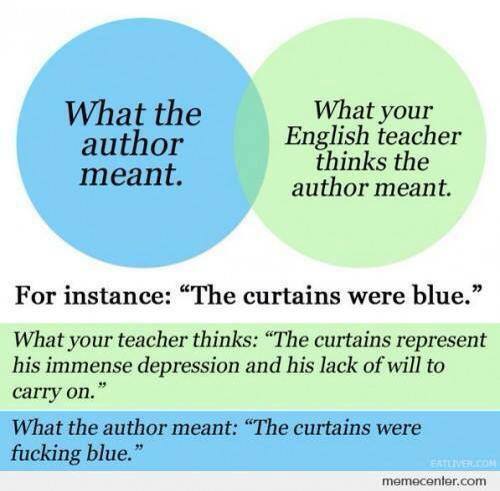 I taught lit to eighth graders for eight years and every year I heard the following question: How do you know that’s what the author meant? Here is my answer: It doesn’t matter. The author is just one element of the whole reading equation. 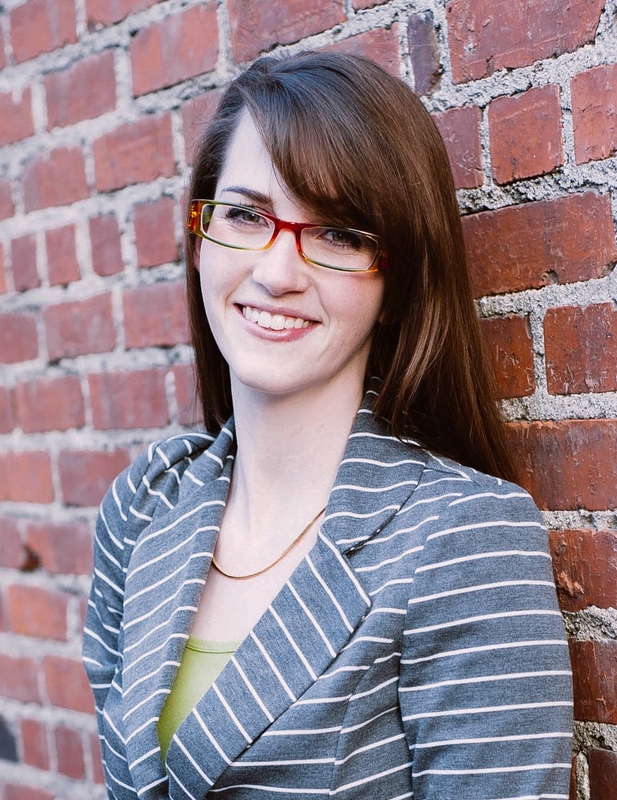 Yes, an author intends to write a story (and by the way, I’m talking fiction here, not like Jonathan Swift’s A Modest Proposal) to tell a story, but we make conscious decisions about that story. How does the character react, how do they grow, what have they learned. Do we put in symbols on purpose? I’m sure some of us do. Some of us end up claiming that we haven’t done anything. I know in my writing I’ve written events or scenes that are based on political events that riled me up, so I added them to my book to show my disapproval. I also know things have appeared in my book that I never knew I put in. In one book in particular I have three chapters in a row that all start in the same manner but then the plot takes them in different directions, which I thought was a cool way to show different viewpoints, but I didn’t know I had done that. In my most recent manuscript, I have a chapter that switches between the villain and one of the heroes and each POV switch shows their reactions to the same events. I didn’t plan that. So yes, I would say most authors just write a story, but upon analysis stuff starts to appear. When an author releases a book to the public, the book is no longer theirs, by which I mean that they wrote it, but the words are open to interpretation. If it wasn’t, then we wouldn’t argue over the merit of certain books. Once the work is out there, the reader brings his or her own experiences to the story. If I find something meaningful in a novel, then it’s there for me, whether the author meant it or not. The author ceases to be the only one who can give input on a story. I’m pretty sure that most authors love the stories they write, or at least put their souls into them, but they will encounter readers who don’t like the stories. So is the reader wrong? Or is the writer? Neither. They bring their own interpretation. So if I find something in a story that I believe is a symbol, and I can back it up with evidence from the text (this is the crucial next step), it’s there. It’s this last step that people don’t like about studying literature. Backing things up. It’s easy to simply spout ideas without worrying about proving them, but your ideas don’t hold up unless you have evidence. If I say Huck Finn’s lies are actually good things, I’d better be able to find paragraphs that support what I say (And I can–I know The Adventures of Huckleberry Finn). So next time you’re tempted to dismiss someone’s interpretation of a text, listen to them instead. Ask them for proof. You might become convinced. And if you’re an author who claims you only written a story, well, you might be wrong. The curtain might be blue because it represents his immense depression. Could also be that they were simply blue. Thought you might want to learn more about me. In which I give a summary of my vacation to California and how it ties into life and writing. When Robot Guy gets restless, he wants to head to California and revisit our roots. Both of us were raised there (he was born in Michigan, but grew up in San Diego) and big parts of our families still live there. So we left home just before Labor Day to make the long drive to California. It’s about 11-13 hours in the car, depending on where and how often we stop. Mind you I like California, but for me it’s not a vacation. Okay, I get a break from cooking (my mother or sister insist on doing all that, or we go to restaurants when we’re out), it’s definitely a chance of venue, and we always try to do a vacationy thing while we’re out there, but California is familiar. To me, a vacation is something new, and California is not that. It’s visiting relatives. We had planned on staying for eight days, and had something planned for everyday. First was reconnecting with my family. We spent our first full day at my sister’s, in her pool, and in front of the TV. The TV is always on at her house (not a judgment, just a statement of fact). Besides which it was US Open time and my mother, who was also there, is a HUGE tennis fan. Next day was reconnecting with old friends,the man who served as Robot Guy’s Best Man and family. We walked around Hermosa Beach at the end of their weekend festival. Now if you know me, crowds are not my thing, and there was a crowd. But Robot Guy was able to play sand volleyball (just a little) and go body surfing before the lifeguards chased them out of the waves (The big surf caused by a passing hurricane was just coming to its end). Tuesday was my daughter’s choice of Universal Studios Hollywood. I hadn’t been in decades–the last time I was there, I posed with a life-sized cardboard display of Tom Selleck in Magnum. It’s very different now. Oh, the tour of the studio still exists, but all the details that made it so interesting for movie buffs like I used to be are gone. They don’t point out Lucille Ball’s dressing room anymore (or just barely) and Hitchcock’s old cabana is now an office for some production company. I suppose young people today don’t know Hitchcock. I know I showed my kids PSYCHO and TO CATCH A THIEF as part of their education. But it was fun. The Jurassic Park Ride is a (wet) blast, the Mummy roller coaster is a lot of fun, and the Despicable Me ride is loads of 3D fun. They have some fine shows too. I had visited Universal in Orlando for Harry Potter World before the new expansion and enjoyed it, but was a little underwhelmed. I was raised on Disneyland, you know. I felt the same about Universal Studios Hollywood. They had limited hours now that “summer” is over, but it was the perfect amount of time. And I will have to go back. Why? Harry Potter World is being furiously built in California as I type this. We drove down to San Diego to visit my father-in-law. Robot Guy and his dad drove around to see the old homesteads, while youngest and I caught a movie–Teenage Mutant Ninja Turtles (all I can say is it is definitely a Michael Bay film). 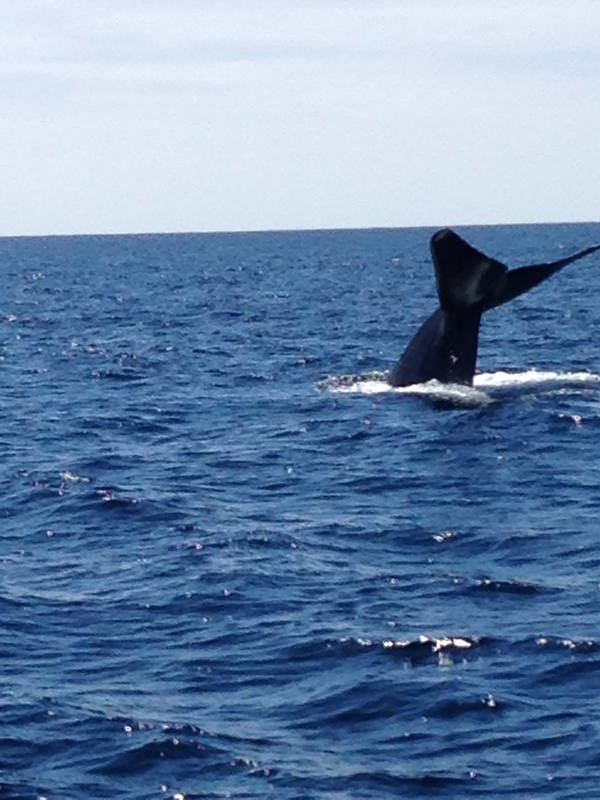 But the highlight of our trip was whale watching. We took a catamaran (I say “we”, but “we” did none of the sailing) from Dana Point for three hours on the ocean. I can think of a few words to describe the experience without hyperbole–incredible, amazing, awesome (in its try sense), inspirational, breathtaking. 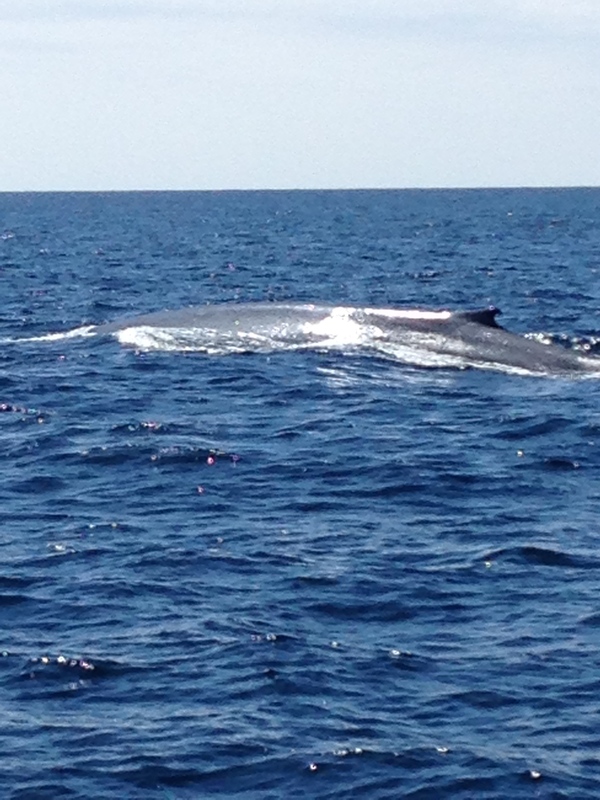 Blue whales have been spotted with some frequency off the coast, and we saw three. BLUE WHALES! I never thought I’d see them in my lifetime. As a kid I was sure they’d be extinct by the time I reached adulthood. They’re making a comeback, folks. Back of a blue whale. It’s too soon to be complacent, but it does give one hope for the future (Maybe. A little). We also sailed among a huge pod of common dolphins. Watching them frolic in the water, you have to believe they are consciously having fun. What a day. We came home from our trip a day early to mow the lawn and do laundry. Besides, the dogs missed us. I got little writing done despite my best intentions (My dear agent: ignore the last sentence. I wrote so much! ), and it took us that day to get back into the groove. So now it’s off to the mundane and comfortable. That’s not so bad either.